کرامتی, محدثه, نصرتی ششکل, بابک, محبّی گرگری, رحیم, عبدوس, مجید. (1395). تاثیرذرات نانورس و سازگارکننده MAPP بر خواص فیزیکی و مکانیکی چندسازه ساخته شده از کاغذ باطله / پلی‌پروپیلن. مجله صنایع چوب و کاغذ ایران, 7(2), 193-206. محدثه کرامتی; بابک نصرتی ششکل; رحیم محبّی گرگری; مجید عبدوس. "تاثیرذرات نانورس و سازگارکننده MAPP بر خواص فیزیکی و مکانیکی چندسازه ساخته شده از کاغذ باطله / پلی‌پروپیلن". مجله صنایع چوب و کاغذ ایران, 7, 2, 1395, 193-206. کرامتی, محدثه, نصرتی ششکل, بابک, محبّی گرگری, رحیم, عبدوس, مجید. (1395). 'تاثیرذرات نانورس و سازگارکننده MAPP بر خواص فیزیکی و مکانیکی چندسازه ساخته شده از کاغذ باطله / پلی‌پروپیلن', مجله صنایع چوب و کاغذ ایران, 7(2), pp. 193-206. کرامتی, محدثه, نصرتی ششکل, بابک, محبّی گرگری, رحیم, عبدوس, مجید. تاثیرذرات نانورس و سازگارکننده MAPP بر خواص فیزیکی و مکانیکی چندسازه ساخته شده از کاغذ باطله / پلی‌پروپیلن. مجله صنایع چوب و کاغذ ایران, 1395; 7(2): 193-206. در این پژوهش، اثر مقدار ذرات نانورس و سازگارکننده بر ویژگی‌های فیزیکی و مکانیکی چندسازه چوب‌پلاستیک حاصل از پلی‌پروپیلن و الیاف کاغذ باطله تحریر مورد بررسی قرار گرفت. برای این منظور، الیاف کاغذ باطله و پلی‌پروپیلن با نسبت‌ وزنی 50 درصد، به‌همراه ذرات نانورس (در سه سطح 0، 2 و 4 درصد) و سازگارکننده (در دو سطح 0 و 3 درصد) در دستگاه مخلوط‌کن داخلی در دمای 155 درجه سانتی‌گراد و سرعت ۶۰ دور در دقیقه مخلوط و نمونه‌ها به‌روش ترزیقی تهیه گردید. نتایج نشان داد که مقاومت‌های فیزیکی و مکانیکی چندسازه در حضور سازگارکننده بهبود یافته است. همچنین با افزودن مقدار ذرات نانورس و افزایش سطوح آن خواص جذب آب، واکشیدگی ضخامت، مقاومت‌های خمشی و کششی و مدول الاستیسیته خمشی وکششی چندسازه بهبود یافته است در صورتی‌که مقاومت به ضربه نمونه‌ها، دستخوش کاهش شده است. همچنین مطالعات ساختاری چندسازه به‌روش پراش اشعه ایکس نشان داد که توزیع ذرات نانورس در زمینه پلیمری از نوع بین لایه‌ای بوده، و با افزایش مقدار ذرات نانورس فاصله بین لایه‌ها افزایش یافته است. Shateri, A.M. and Rahmati, A.R., 2012. Human’s environmental laws, regulations, criteria and standards. Environmental Protection Agency (EPA), Hak publications, 336 p. (In Persian). Barzgar Shiri, M., Mohammadi, H. and Akhlaghi Amiri, Z., 2009. The use of agricultural waste for the manufacture of composite. In: Proceedings of Clean Agriculture Congress. Gorgan University. May.26-27 Sopron, Gorgan, p 1–12. (In Persian). Hoseinzadeh, A., Madanlou, J. and Tazakor Rezaei, V., 2012. Effect of mineral talc on the strength of composite polypropylene / wood flour. Journal of Natural Resources, Science and Technology, 7(1): 71-86. (In Persian). Wood hams, R.T., Shianglaw, L. and Balatinecz, J., 1991. Intensive mixing of wood fiber with thermoplastics for injection molded composite in wood / plastic composite, Conference proceeding. Madison, Wis., USA, 75-78. Chaharmahali, M., Kazemi Najafi, S. and Tajvidi, M., 2006. The effect of producing method on the mechanical properties of wood plastic composites made from particleboard wastes. Iranian Journal of Wood and Paper Science Research, 21(1): 33-42. (In Persian). Cope, C.W., 1998. Polymer and wood flour composite extrusion, US 5847016 A, Dec.8, United State. Mirshokraei, S.A., 2002. Chemistry of paper, Publications of Adineh book. 184p. (In Persian). Mirshokraei, S.A., 2004. Pulp and paper technology. Publications of Adineh book. 520p. (In Persian). Afra Bandpie. E., 2003. Basics features paper. Publications of Aeijh. 392p. (In Persian). Lu, Z.J., Qinglin, w. and Mcnabb, H.S., 2000. Journal of Chemical Coupling in wood fiber and polymer composites: a review of coupling agents and treatments. Journal of Chemical coupling in wood Fiber Science, 32(1): 88-104. Thwe, M. and Liao, K., 2000. Tensile behavior of modified bamboo-glass fiber reinforced hybrid composite. Journal of Plastics Rubber and Composites, 31(10): 422-431. Raj, R.G., Kokta, B.B., Grouleau, G. and Daneault, C., 1990. The Influence of coupling Agents on mechanical properties of composites containing cellulosic fillers. Journal of Polymer Plastic Technology Engineering, 29(4): 339-353. Adhikary, K.B., Pang, S. and Staiger, M.P., 2008. Long-term moisture absorption and thickness swelling behavior of recycled thermoplastics reinforced with pinus radiata sawdust. Journal of Chemical Engineering, 142 (2): 190-198. Taheri, F., Enayati, A., Oromiehie, A. and Tajvidi, M., 2011. Effect of different polypropylene grades and coupling agent on the properties of wood plastic composites. Iranian Journal of Wood and Paper Science Research, 26(4): 757-771. (In Persian). Dang, W., Song, Y., Wang, Q. and Wang, W., 2008. Improvement in compatibility and mechanical properties of modifiedwood fiber/ polypropylene composites. Front. For China, 3(2): 243-247. Wang, H.C, Zheng, M., Elkovitch, L.J., Lee, G. and Koelling. K.W., 2001. Processing and properties of polymeric nanocomposites. Journal of Polymer Engineering Science, 41(11): 236-246. Kord, B., 2010. Investigation on the effects of nanoclay particles on mechanical properties of wood polymer composites made of high density polyethylene-wood flour. Iranian Journal of Wood and Paper Science Research, 25(1): 91-101. (In Persian). Kord, B., 2009. Improvement of practical properties of wood polymer composite with nanoclay particles. Journal of engineering materials, 1(4): 375-383. (In Persian). Wang, L., Wang, K., Chen, L., Zhang, Y. and He, C., 2006. Preparation, morphology and thermal/mechanical properties of epoxy/nanoclay composite. Journal of Applied Science and Manufacturing, 37(11): 1890–1896. Zahedi, M. and Tabarsa, T., 2013. Physico-mechanical and morphological properties of nanocomposite made from Canola stalk. Iranian Journal of Wood and Paper Science Research, 28(4): 742-754. (In Persian). Sanadi, A.R. and Young, R.A., 1994. Recycled newspaper fibers as reinforcing fillers in thermoplastics. Journal of Reinforced Plastics and Composites, 13(1): 54-67. Mehrabzadeh, M. and Farahmand, F., 2001. Recycling of commingled plastics waste containing polypropylene, polyethylene, and paper. Journal of Applied Polymer Science, 80(13): 2573-2577. Shakeri, A., Dosthoseini, S.K. and Ebrahimi, Gh., 2005. Improvement in mechanical properties of cellulose fibers-thermoplastic polymer composite. Journal of Polymer Science and Technology, 18(3): 143-150. (In Persian). Dosthoseini, S.K., Ebrahimi, Gh. and Shakeri, A., 2003. Mechanical properties, and morphology of impact modified polypropylene cellulose fiber composite. Iranian Journal of Natural Resources, 57(1): 121-132. (In Persian). Rangavar, H., 2013. Study on the possibility of recycled-banknote utilization in the production of wood gypsum composite-boards. Iranian Journal of Wood and Paper Industries, 4(1): 87-99. (In Persian). Enayati, A.A. and Hoseinaei, O., 2007. Utilization of recycled banknote in manufacturing particle board. 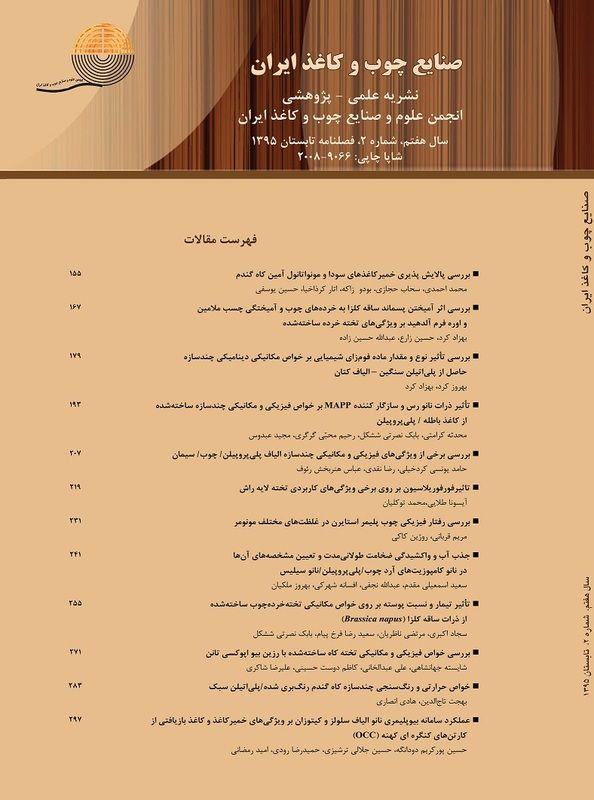 Iranian Journal of Natural Resources, 60(3): 1023-1036. (In Persian). Wu, Q., Lei, Y., Clemons, C.M., Yao, F., Xu, y. and Lian, K., 2007. Proportion of HDPE/Clay/Wood nanocomposites. Journal of Plastic Technology, 27(2): 108-115. Yang, H.S., Wolcott, M.P., Kim, H.S., Kim, S. and Kim, H.J., 2007. Effect of different compatibilizing agents on the mechanical properties of lignocellulosic material filled polyethylene bio-composites. Journal of Composite Structures, 79(3): 369-375. Rana, H.T., Gupta, R.K., GangaRao, H.V.S. and Sridhar, L.N., 2005. Measurement of moisture diffusivity through layered-silicate nano composites. AIChE Journal, 51(12): 3249-3256. Alexandre, B., Marais, S., Langevin, S., Médéric, P. and Aubry, T., 2006. Nano-composite-based polyamide 12/montmorillonite: relationships between structures and transport properties. Journal of Desalination, 199(1-3): 184-166. Bharadwaj, R.K., Mehrabi, A.R., Hamilton, C., Trujillo, C., Murga, M., Fan, R., Chavira, A. and Thompson, A.K., 2002. Structural property relationship cross-linked polyester clay nanocomposites. Journal of Polymer, 43(13) 3699-3705. Kord, B., Hemmasi, A.H. and Ghasemi, I., 2011. Properties of PP/wood flour/organ modified montmorillonite nanocomposites. Journal of Wood Science and Technology, 45(1): 111-119. Asif, A., Roa, L.V. and Ninan, K.N., 2007. Hydroxyl terminated poly (ether ether ketone) with pendant methyl group-toughened epoxy ternary nanocomposites: preparation, morphology and thermo mechanical properties. Journal Applied Polymer Science, 106(5): 2936-2946. Chen, H., Wang, M., Lin, Y., C.M. and Wu, J., 2007. Morphological and mechanical property of polypropylene nanocomposites with nanoclay particles. Journal of Applied Polymer Science, 106(5): 3409-3416. Zhao, Y., Wang, K., Zhu, F., Xue, P. and Jia, M., 2006. Properties of poly (vinyl chloride)/wood flour/montmorillonite composites: Effects of coupling agents and layered silicate, Journal of Polymer Degradation and Stability, 91(12): 2874-2883. Han, G., Lei, Y., Wu, Q., Kojima, Y. and Suzuki, S., 2008. Bamboo–fiber filled high density polyethylene composites; effect of coupling treatment and nanoclay. Journal of Polymer Environment, 16(2): 123-130. Chowdhury, F.H., Hosur, M.V. and Jeelani. S., 2006. Studies on the flexural and thermo mechanical properties of woven carbon/nanoclay-epoxy laminated. Journal of Material Science and Engineering A, 421(1-2): 298-306.